In Arizona, we are so proud of our native Saguaro Cactus that many people have them in their own yards! The Saguaro Cactus also has beautiful white and yellow flowers that bloom at night April through June. Did you know that just like the Prickly Pear, the Saguaro also has ruby red fruit that is edible and is ripe and ready to eat in June? The problem is that the fruit is not easy to pick because a Saguaro Cactus can grow anywhere from 15 to 50 feet. We found that the birds sure love this sweet and delicious fruit! 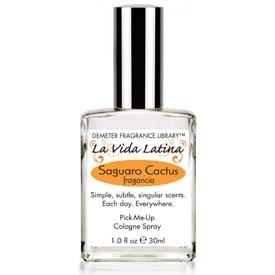 We hope that you love your Saguaro Cactus Cologne just as much.